September 22nd marks the beginning of fall and no more 100 degree days. Ahhh so nice! It’s been a wonderful 84 degrees and with the change of the weather it inspired me to create this card for Hand Stamped Sentiments sketch challenge. I played with the Sweater Weather DSP featured in the Stampin’ Up! holiday catalog. Such pretty colors – Chocolate Chip, Crushed Curry, Sahara Sand, Soft Sky, Tangerine Tango, Very Vanilla and Whisper White – make this paper perfect for all your fall projects. I started with a Very Vanilla card base and die cut the leaves with the Autumn Accents Bigz die. For the leaves I used cardstock and the Sweater Weather DSP. I sponged the edges with Early Espresso and used the Houndstooth and Wood Grain embossing folders for texture. For bling and sparkle I colored basic rhinestones with Sharpies and spritzed my card with Vanilla Shimmer Smooch Spritz. It’s hard to photograph and show how sparkly the Vanilla Shimmer Smooch Sprintz looks but if you enlarge the photo you should be able to see it. Go to Hand Stamped Sentiments to see the other projects created by our very talented design team and be inspired! This week I created a card for Hands Stamped Sentiments color challenge of More Mustard, Old Olive, Early Espresso and Elegant Eggplant. I used the same technique for the leaves as in my fall easel card. This card was easy and fast. 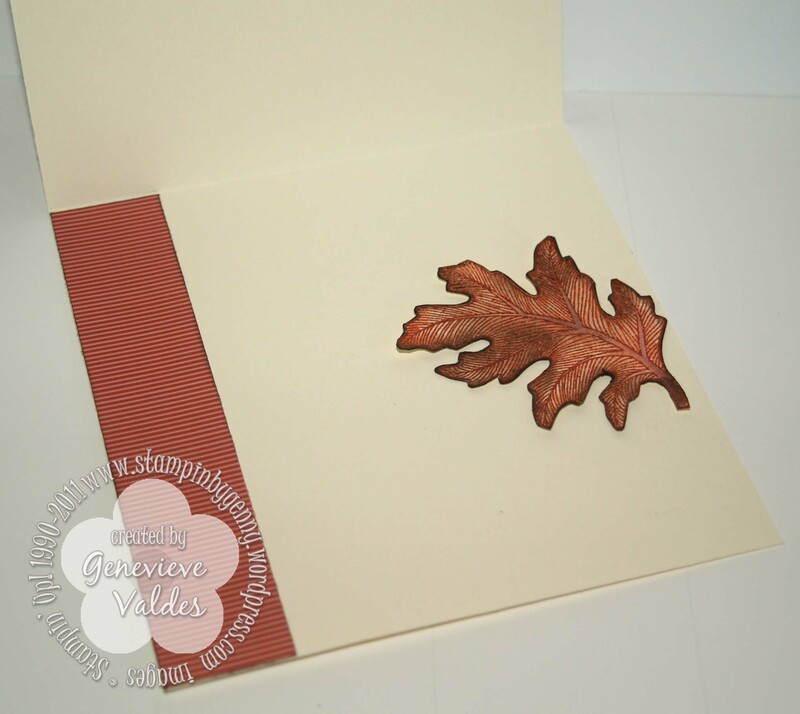 The Wonderfall leaves stamp set and die make it super easy to create leaves. I used the Fancy Fan Textured Impressions folder for the background. I love the pattern it’s so vintage! I used the Scallop border punch for the More Mustard layer and I used one of the Finishing Touches Edgelits Dies for the Elegant Eggplant cut-out border. For some sparkle, I die cut one of the leaves from the Champagne Glitter paper. I love this paper. Just a little goes a long way. The sentiment is from the Day of Gratitude stamp set and embossed with clear embossing powder. Join us this week at Hand Stamped Sentiments and show us your color splash. We’d love to see it! What a great time we had on Saturday! We had lots of giveaways, food and of course stamping! We’re already planning on doing a spring camp. 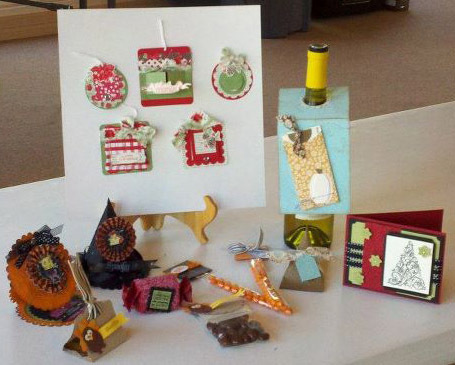 Each attendee made a set of 5 Christmas tags, Fall Wine Bottle Tag (great for a hostess gift), Christmas Card & Candy Wrapper box, Fall Sour Cream Treat Holder, Halloween Treat Sticks, Witches Treat Hat, Halloween Easel Card, Turkey Poop Treat, Turkey Chocolate Treat Gift. You still have a chance to make these for yourself… details below. Here are closer pics of the projects courtesy of my fellow demo friend Erica Cerwin of Pink Buckaroo Design. This tag slips over a bottle of wine. Perfect for a hostess gift. Super cute as a place card for Thanksgiving. Another cute treat for Thanksgiving. 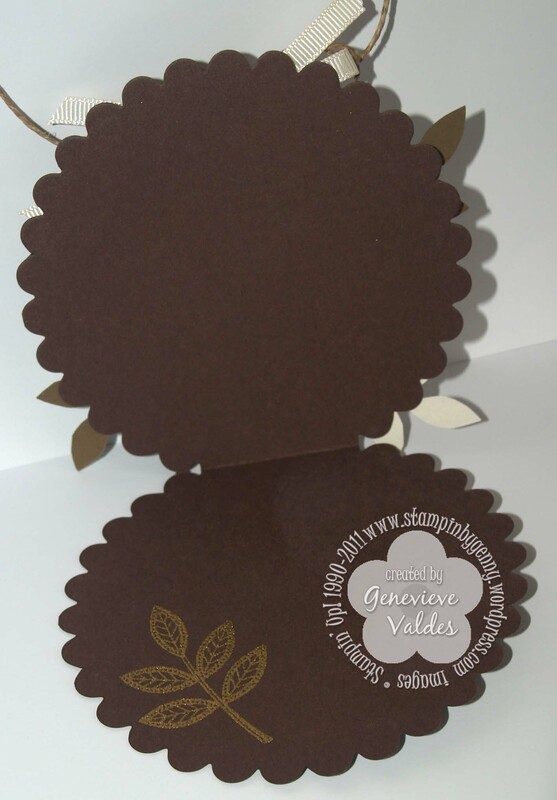 Gorgeous embossed card and candy wrapper. I contributed these projects to the stamp camp therefore the more detailed pics. 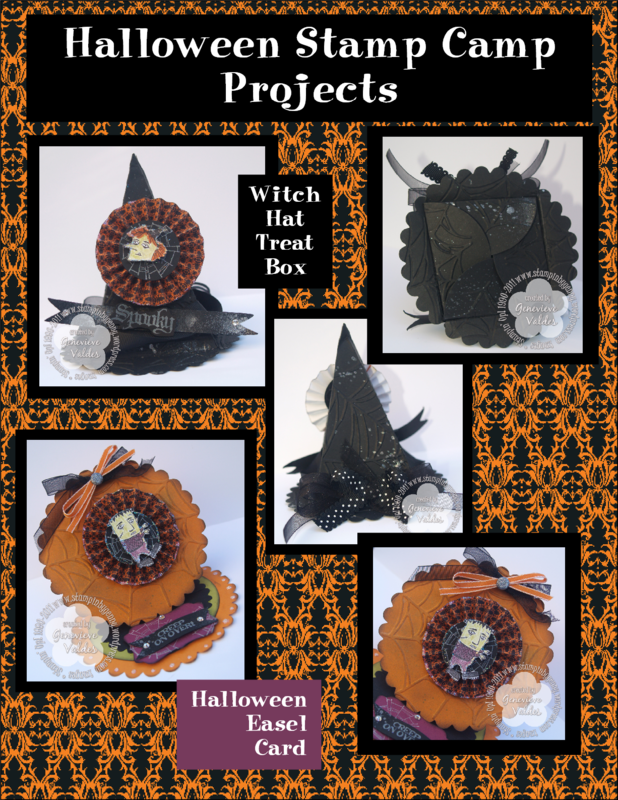 The witch hat treat box would be great for a dinner party place card. The easel card is perfect for a Halloween invitation or greeting. Cute Christmas Tags! You can't have too many. Wish you could have come to spend the day crafting, chatting, winning and more? Well definitely register for next year’s Stamp Camp but if you would like to at least make the projects from this amazing day you are in luck!!! There are 4 to-go-kits available. Each kit has ALL the consumable supplies you need to make these projects. You will get a list of tools you need to complete these projects AND you will get private access to the tutorial videos for each project. You will be able to pause, rewind, or even stop and replay them as your schedule permits. Simply purchase the kit through the PayPal link below. If you are local we can arrange pickup, and if you are not then click on Option 2 Long Distance Mail to add $4.95 for shipping and I’ll mail it to you. This week at Hand Stamped Sentiments we have a fall challenge. The weather here in San Antonio,Texas is still hot but the mornings are cooler and it’s starting to feel like fall weather is getting closer. I have another fall inspired project created with the Days of Gratitude stamp set. I wanted to use it in different way so I decided to heat emboss all the images in gold embossing powder. Here’s my project. Here in San Antonio we’ve had record high temperatures. 110 degrees on Sunday! Unbelievable! All this heat has made me wish for autumn. Cooler mornings and days is what everyone in San Antonio is wishing. I can’t wait. Later this week the temperature should drop to 90 degrees which will be wonderful. So much for the weather and on to my project. Wanting for autumn to arrive I decided this would be my inspiration for this week’s card for Hand Stamped Sentiments Monochromatic Theme Challenge. I used one of my favorite stamp sets, Autumn Splendor to create the leaves for an autumn wreath. I stamped the leaves with Versamark and Cajun Craze then heat embossed with clear embossing powder. To add more color to the leaves I used my blender pen with Cajun Craze, Early Espresso and Calypso Coral. 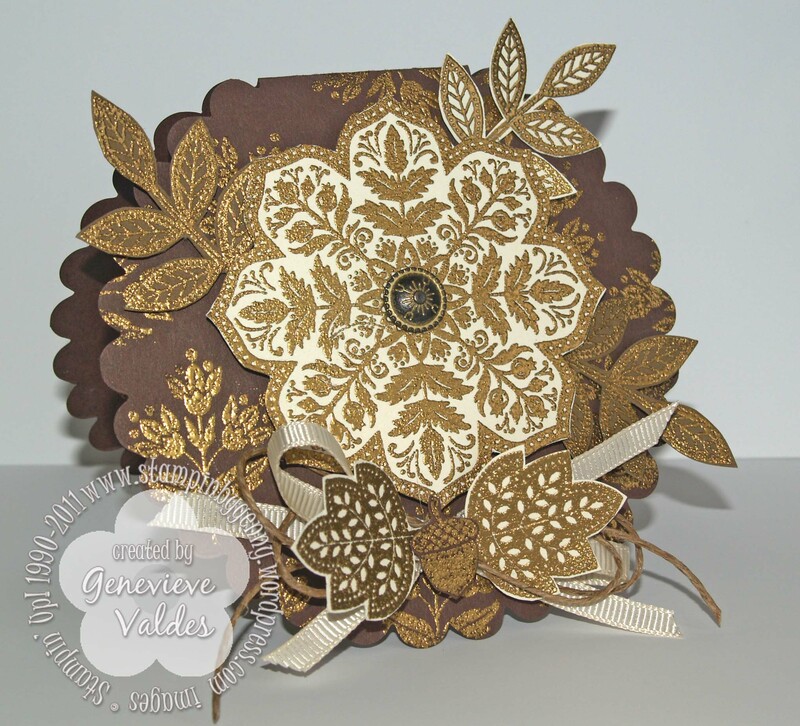 To see more fabulous projects for this monochromatic challenge go to Hand Stamped Sentiments.